Jamo Graphic review | What Hi-Fi? These are ideal. We thought we'd get that in early, in case the star rating of these clever Jamos sent you skipping away. This is the scenario: you're buying a new home cinema system, with your receiver and front speakers costing you at least a grand. What are you going to do for rear speakers, especially if you're unable to position a pair of Monitor Audio Bronze BR2-sized standmounters next to the sofa? How about some full-range, glass-fronted wall-mountable speakers instead? Just 8cm deep and with a 13cm mid/bass driver and a 2.5cm tweeter, each Graphic speaker features an angled rear reflex port and a range of magnetic grilles – including lime green. Wall hanging is simple thanks to the shaped cutaways, while the cable binding posts are out of sight. With the cable chased into your wall, these Jamos are far, far less obtrusive than more conventional designs. As rear speakers, they work well. 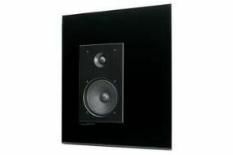 They create a proportioned soundstage, and are detailed in the midrange. They're responsive enough to deal with transient effects, and burly enough to cope with big dynamic upheavals. Taken on the ‘quality-per-pound' terms we employ, they fall short. In a stereo set-up, bass is a bit remote and they don't focus as effectively or attack as confidently as cheaper competitors. But in the right circumstances, a pair of these could be just what your system requires.